Description: Level: Aimed at engineers, managers, product / process design engineers, CAD, CAM, CAE, IT experts, industrial and manufacturing systems engineers, quality control engineers, factory designers, and professionals interested in learning about PLM. Several sections and cases could be ideal for PLM marketing, for undergraduate and graduate education, and even for high school students and technicians learning/ exploring advanced 3D product / process design, teamwork, factory automation principles, and related technology. Industrial Sponsors/ Contributors include with special thanks to Dassault Systemes and DELMIA, USA, IBM, CIMware Ltd. UK, CIMware USA, Inc., and others. 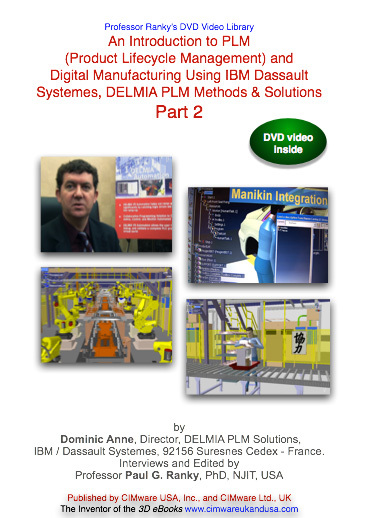 Contents: This electronic publication is a professional quality DVD video presentation by Dominic Anne Director, IBM Dassault Systemes DELMIA PLM Solutions, Dassault Systemes and DELMIA, France, focusing on the key elements, and the benefits of Digital Manufacturing, within PLM (Product Lifecycle Management). The presentation includes several advanced product design, digital manufacturing, assembly and process planning and simulation use cases, mostly from the automotive industry, nevertheless the principles presented apply to literally any industry. What you will learn: Having worked through the material, you will be able to understand the key concepts of an advanced PLM system with several exciting demonstrations and use cases in the digital manufacturing domain. Furthermore, you will learn about the cost savings and quality aspects of integrated, advanced 3D product / process design, system simulation and integration principles, methods, tools and technologies. System Requirements: DVD-ROM: NTSC standard definition (SD) DVD video player for TV, or computer. Approximate length 38 minutes, in 16:9 wide screen format, also playable on a 4:3 regular screen, or any good computer screen (min. 800 x 600 resolution). Furthermore available in SD PAL DVD video, streamed digital and Video iPod media formats (for the Apple Video iPod). The HD (high-definition NTSC and PAL) formats are also available as soon as the HD DVD standard is finalized and players are available. Please visit www.cimwareukandusa.com for available formats and further products.